Imagine rolling over in bed each morning, awakening your phone and turning to a Facebook product to get caught up on the day's happenings. Sounds like something most of us do anyway, right? In the very near future - as soon as the end of the month, actually - Facebook's long-rumored news reader may finally become part of our information consumption routine. According to sources speaking with Re/code, Facebook's news reading service is known as "Paper." 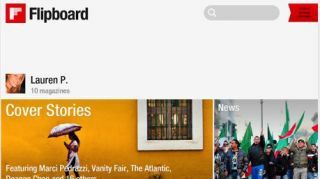 It takes cues from Flipboard, and will either be a standalone app for mobile or a web experience designed to fit smaller screens. Like Flipboard, Paper sounds to be an aggregator for content including news stories from the likes of the New York Times and Washington Post as well as status updates from other Facebookers. It will all be arranged in a eye-popping "paper-like" format, one hard-copy news readers cling to fondly. Paper's launch timeline may change, according to one source, so there's no guarantee we'll be turning to Facebook for all our newsy needs (beyond baby bump updates) come February 1. The first inklings of a Facebook reader first popped up in June 2013, but apparently the project has been years in the making and started as many other FB products have - piece of a News Feed overhaul. We saw some of the new News Feed redesign come to life in March 2013, but the other parts left unfinished have apparently found their way to Paper. If and when Paper makes its way off the virtual presses, users won't be the only ones to benefit from the rich reading experience; engagement and user eyeballs so valuable to advertisers are certainly a driver for Facebook to finish the project. Facebook has already tried to emulate Flipboard, folks.